i watched this last night.. it was only the second time i have ever seen it and i had forgotten about how powerful it is...in a disturbing way. i saw another topic on here in the archives and people compared it to River's Edge. i hadn't seen that one either so i went out and watched it years ago, thinking it wasn't as disturbing as some others thought, but i liked it. but...this one really got to me. after watching Fast Times At Ridgemont High last weekend, seeing Sean Penn in this was a dramatic change, of course. Christopher Walken as the dad..he was awesome. and it was cool to see Chris Penn in a movie with his bro..playing his bro.....as we all know Chris died 5 years ago. a lot of familiar faces in this, as Sean's group of friends... Kiefer Sutherland, Crispin Glover (who was also in River's Edge) and Stephen Geoffrey's...a.k.a..Evil from Fright Night. 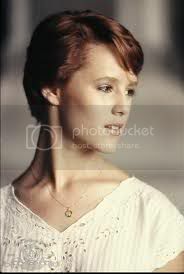 Mary Stuart Masterson was great as Sean's girlfriend in the movie, very young looking, and only one year before she played Watts in Some Kind Of Wonderful,....already sporting to short hair do. the cold blooded-ness of the characters, and the killings, are what got to me. after the movie ended, i still had the song stuck in my head...awesome tune from what i think was her best album..True Blue. throughout the movie, a 'theme' version of Live To Tell can be heard and it makes the movie more haunting, IMO. I have wanted to see this movie for a really long time but have never been able to find a copy of it anywhere. I remember watching the video for "Live to Tell" and seeing clips from the movie and always wondering what's it's about. Ronnie, do you think it's worth checking out? Veronica, i am just like you.. i used to watch the Madonna vid and wonder about the movie too. i caught it on cable the first time, last night it was on tv and, i didn't see the beginning but i think it's a good movie to see at least once. wow, i just noticed that the prices are crazy for this dvd?! Veronica i just found it on youtube in 8 parts and in great quality. if you watch it, i'd like to know what you think! 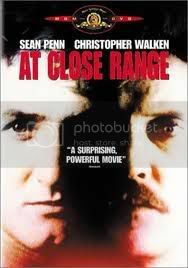 "At Close Range" is definitely an underrated and quite disturbing flick. I think one of the things that always got me was that it was based on a true story. The cast alone should make this worth watching for any 80's fan. You have Christopher Walken turning in one of the best roles of his career. Did you know that the role was first offered to Robert DeNiro who turned it down stating that the character was too dark? Sean Penn, newly married to Madonna, played his character with a believable stubbornness and cocky swagger. It is a standout performance as well, especially in the final moments of the film, and gives a glimpse of the talent we would see from him in his later works. I was in shock at the time I watched it to think this is the same actor that played Spicoli. And Ronnie.. did you know this? "Live To Tell" was written by Patrick Leonard for the soundtrack of the film ‘Fire With Fire’, but Paramount decided not to use it. Leonard then asked Madonna to check it out, and it ended up being used exclusively in "At Close Range" as not only the title song, but also as the score. Wow!! Finally, Veronica this movie is disturbing... but as a horror fan.. I think you'll be okay. Give it a try! I caught the beginning of this on tv a few months ago and really liked it......the part where he meets Mary Stuart in town is great.....I thought it was filmed so beautifully. I'm like you girls....grew up watching the Madonna video....always loved it and wondered about the movie but never saw it. We have this on dvd and may still have the vhs. Great movie-my husband loves the part where the stool pigeon claims to Walken that he was "pumping the cops for information". Walken tells him "We're drunk as skunks, we want you to be the same." Classic. valley - didn't know that about the music! and i forgot the beginning does say it's based on a true story...wow...sad. the second the movie ends, bam! madonna's song kicks in and even before the credits start rolling, it mentions that the song was written by Patrick Leonard and performed by Madonna. they got the song credit in there before the actors haha. i think Veronica will find it interesting. Bamersy - i love that quote. that scene turns bad but the dialog in the car is funny. Walken is awesome. mgm HD channel is where i watched it. i checked the channel for the rest of the week and didn't see it listed again. Muffy - i love the part where Sean first sees Mary ..and the music just makes it more intense. well the picture quality is great on the youtube channel but the sound is a bit loud. I haven't seen this one yet. Muffy- I think once in a while it's been on ONdemand for free. They might have it at my library- I will look for it. Ronnie- I agree with you- Madonna is not my fave, but I did think True Blue was her best album. My husband has the cd, but the one he has is a limited edition. Splendid movie with a terrific, hateful performance by Christopher Walken, one of his best. The real-life case of Bruce Johnston, Sr. and Bruce, Jr. was tried in the very courtroom where many years ago, as a young Assistant District Attorney, I prosecuted many murder cases myself. The Johnston Gang story is incredibly disturbing. I used to think about it when I was sitting in that main courtroom looking up at the beautiful stained-glass dome. "Live to Tell," a wonderful performance by Madonna, fit the mood of "At Close Range" perfectly. Pitts - i think you'd enjoy it. try to watch it! your hubby and mine, both have this album haha, my hubbs thinks it's her best too. and Crash - good job on the DA stuff. i'm interested in the case now. and the more i think about this movie, i feel like i want to see it again now..
and a good description of Walken's performance, terrific, yet hateful.. so true. This just got a scandi release. So i´m gonna get the dvd and watch the movie in the near future. The director, James Foley, also did the Rewind favorite "Reckless." He's a good director who doesn't always get the best material, but here he has great material. James Foley also directed a couple of Madonna videos in the 80's too, as well as the movie "Who's That Girl" if I'm not mistaken. And was best man at Sean Penn and Madonna's wedding, according to imdb.com! I remember seeing it for sale on DVD about 6 years ago and grabbed it straight away. I wanted to see it for ages, like many after seeing the Madonna clip. I am a massive Penn brothers and Walken fan, but this movie didn't do it for me. After all the praise it is getting here I am gonna check it out again. I'll report back soon as I still have the DVD. This was yet another movie that put Penn above most of the brat-packers of the time. 'Intense' would be the best way to describe him. I liked Jimmy Jimmy! Ok... it is definitely an album track. But then again so are 'White Heat', 'Love Makes the World Go Round' and 'Where's the Party'. Let's face it; they mined that album for every single they could. fyi.. At Close Range is on tonight on the mgm HD channel. Very good movie with great cast. Really tragic true life story. I love the score composed by Patrick Leonard, atmospheric stuff and uses nicely those "Live to Tell" melodies. I´m a big fan of Patrick´s old band Trillion and his Toy Matinee/Third Matinee projects.